These Sign Supplies are Durable Message Flags! Bulk Sign Supplies Online! Sign Making Supply Company Sells Wholesale Equipment! 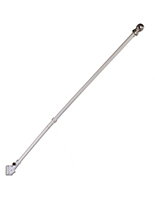 Outdoor kit includes (1) flag, (1) pole & (1) mounting bracket. "Open" message has a standard yet eye-catching design. 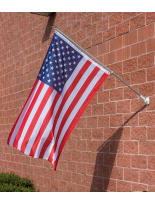 Nylon flag is double-hemmed for added strength. Red, white & blue coloring won't fade over time. Adjustable bracket ranges from 0° to 90°! 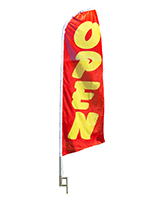 Sign supplies are used to convey to clients when your store is open. 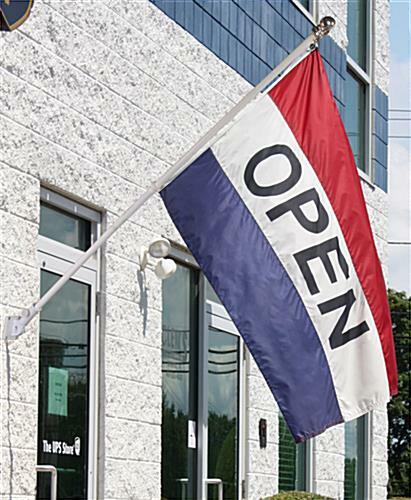 These open flags, sign supplies use the common red, white and blue design that is familiar to clients so they know to look at the flag for a message. Sign supplies, also recognized as publicizing flags, say the word "open," composed in black lettering across the middle of a flag. These sign supplies are made of nylon, which means they are will have a long life and are climate-tolerant! Two brass grommets enable for these flags to safely attach to the supplied metal pole. 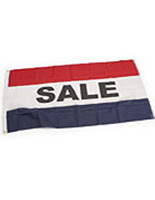 We also provide these sign supplies with a 1/4" diameter washer to reinforce a flag's connection. Cheap sign supplies online meet your business needs! These sign supplies for shops have everything you have to produce an appealing outside exhibit. 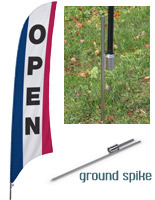 The publicizing flags, sign supplies include the following products: (1) 3' x 5' nylon open flag, (1) 5' metal flagpole and (1) affixing mount. 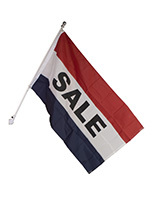 We also include an adaptable mount with these sign supplies giving you the power to alter the angle of the exhibited flags. The mount's angles range from 0° to 90°! 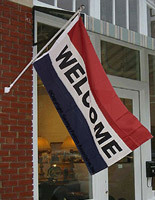 Sign supplies, as well as publicizing flags, enable you the effectively present outdoor messages the easy way! Buy wholesale sign supplies online today!